BEAMCOL9" is a spreadsheet program written in MS-Excel for the purpose of analysis and code checking of steel beams and columns. 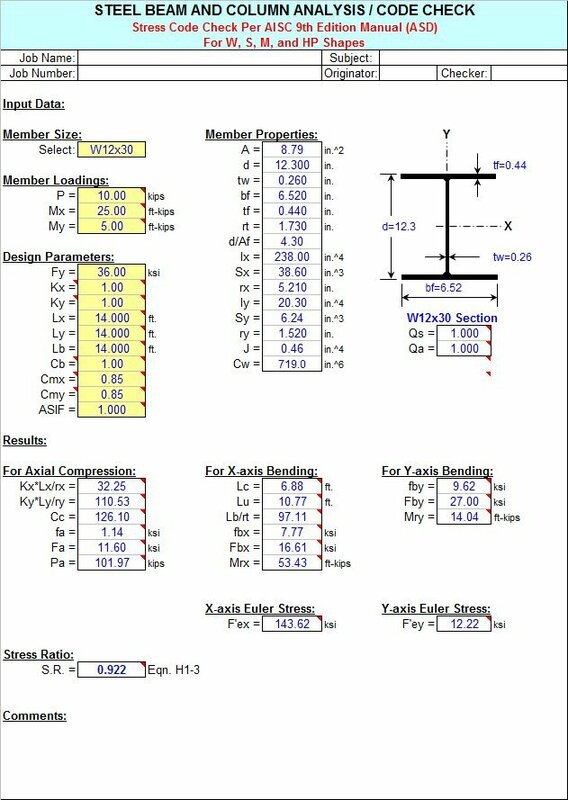 Specifically, beams and columns are analyzed / code checked per the AISC 9th Edition Allowable Stress Design (ASD) Manual. Both actual and allowable stresses are computed, with the final result being a computed "stress ratio" of actual stress/allowable stress. Also, a list of the lightest weight members which satisfy the code check is displayed for convenience. 1. This program follows the procedures and guidelines of the AISC 9th Edition Allowable Stress (ASD) Manual (1989). 2. This program uses the database of member dimensions and section properties from the "AISC Shapes Database", Version 3.0 (2001) as well as the AISC 9th Edition (ASD) Manual (1989). 4. This program is NOT valid for tees (WT shapes) and angles. 5. 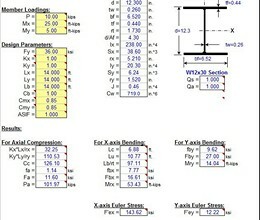 In this program for members subjected to known loadings consisting of axial load (compression or tension) and/or uniaxial or biaxial bending, both the actual and allowable stress are computed, with the final result being a computed "stress ratio" of actual stress/allowable stress. 6. The "BeamCol(Built-Up)" worksheet will require the input for the total depth, web thickness, flange width, and flange thickness. Then, all the remaining section properties are automatically calculated, assuming straight, non-sloping flanges. 7. This program utilizes an "Allowable Stress Increase Factor" (ASIF) which is a multiplier of any of the calculated allowable stresses Fa, Fbx, and Fby and also the Euler column buckling stresses F'ex and F'ey. It is used and appears ONLY in the stress ratio calculation. Typically a value of 1.0 may be used. However, a value of 1.333 may be used for load combinations which include wind or seismic loads. 8. If an axially loaded compression member has a value of the maximum slenderness ratio K*L*12/r >200, then a message will appear. However, this program DOES NOT consider or deem a particular member as "inadequate" based on the slenderness ratio of 200 being exceeded. 9. For the case of combined axial compression with bending, if the calculated value of fa >=F'e (which is not allowed) then a warning (error!) message will appear. 10. When the values of either 'Lx', 'Ly', or 'Lb' are input = 0' (or actually <= 1.0'), this program will use a value = 1.0'. 11. When a stiffened element (web) of a member subjected to axial compression is classified as a "slender" element (exceeding non-compact limits) based on local buckling criteria, then the program complies with AISC Appendix B. 12. In the "BeamCol(C)" worksheet for channels subjected to Y-axis bending, the properties database uses the minimum value of 'Sy'. However, it is desired to calculate the bending stress at the back of the channel instead of at the tips of the flanges, this may be done by computing a "reduced effective" Y-axis bending moment, Mye = My*Sy*(xbar)/Iy , for member loading input. 15. This program does not consider torsion on member. 16. This program does not consider deduction for holes in members subjected to tension. * BEAMCOL9 download link provides freeware version of the software. Stepped column analysis for determining effective lengths and effective length K factors. BEAMCOL9 has been rated 5.0 out of 5 points. A total of 2 votes cast and 0 users reviewed the software.